Hello fellow farmers! Welcome to day one of our September previews. We are going to get you in the mood for Christmas with all our lovely new stamps. So let's get started! Today we are showcasing a new Holiday Anya 4! 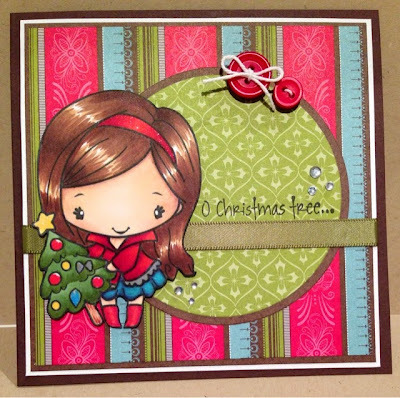 I teamed her up with some Stampin' Up papers from my stash and colored with copic markers. Make sure you leave some love on all the design teams blogs to be in for a chance to win this new stamp. Come back tomorrow to see our Day 2 preview. Utterly sweet! Great card too, love the DP's. Anya is just too cute! Amazing card. Love the colors you choose to color her outfit and how you created an ornament to buttons and a circle. I love the new Christmas Anya!! So cute a real must have. will hop around to see the other samples. Colors and DP are beyond cute and those buttons are a fabulous touch TFS! So stinking cute! I'm now in the mood to make Christmas cards!!! Love the colors of the card. And like how every color she has is somewhere in the background. Muy hermosa se ve esta Anya en tu tarjeta los colores son super lindos..te felicito!!!! So pretty!! Love the papers! Love the papers and design! So cute! Great colors and card design! Adorable! I especially love how you colored her hair! She is catapulting to the top of my TGF wishlist for sure! She is so pretty and sweet, I adore this image! I love the pops of pink on this card! my sister loves pink! Beautiful! It all ties in so nicely! So beautiful I just love your card. Super, super gorgeous!! Love the patterned paper, works beautifully with this stunning image. Love, love, love your card! Gorgeous! She is totally adorable! Great coloring and love the paper combo! Cuteee!! Love the laying of the card papers! !